The landscape has changed for all-in-one devices since we were reviewing them six years ago. Entry level models have more features than ever at prices lower than a set of inks. A Confusion of Devices. But they all do the same things. We can't pretend this is a comprehensive review. But we can tell you it's our real-world shopping experience at a big box store. We skipped the office supply stores that feature higher-end models and the low-end stores that offer competent but underwhelming models under $50. Instead we focused on the best entry-level models from Canon, Epson and HP. We've favorably reviewed models from all three companies in the past. Those ran from $59 to $69, about the price of a set of inks. We did our online research to narrow our search down to those three models. But we were quite surprised by our in-store experience with the three units. They're referred to as entry-level machines but they offer features you could only find in higher-end models a few years ago. Let's start with the specifications, move on to a few design considerations, look at ink costs and finally discuss the model we chose. We visited several sites to confirm the specifications for each printer. And we found some variation for each model. So while the comparison may be valid, the specifics may not be definitive. We wouldn't put much stock in the print or scan resolution nor print speed nor the tray capacities, for example. In one case, there simply isn't an input tray at all. 13.6 lbs. 14.8 lbs. 11.93 lbs. The only really self-contained unit is the HP. But even it extends into the room a bit with an arm that swivels out to catch your output. 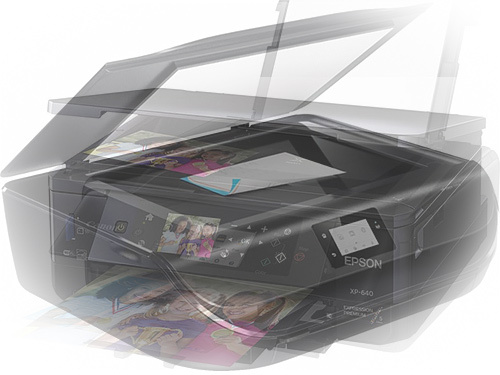 The Epson, which has no input tray other than its back manual feed slot, is the most compact. And the Canon, which seems just right, actually has an input tray that sticks out a few inches from the front. 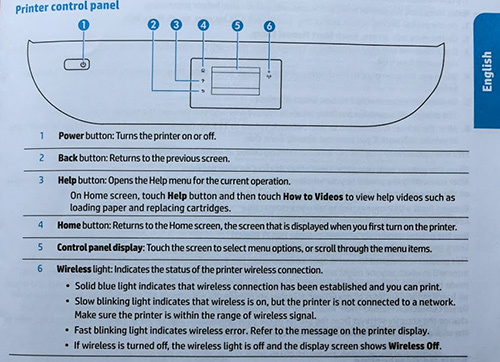 We ran test sheets on the printers at the store and noticed no difference in either scan resolution or print quality. Despite the specs, the Epson seemed to print the slowest. Probably the most important specs are in the ink section. Running an inkjet isn't cheap and the difference in operating costs are substantial with Canon the most expensive and HP the least. But specs don't tell the whole story, as we found out when we got our hands on the units. The design issues were paramount, it turned out. What looked good on paper turned out to be less desirable in reality. We've used Canon all-in-one devices for years. Apart from the obscure but stubborn B200 error (print head replacement), we've never had any trouble with them. So we thought the Canon would be a no-brainer. But when we saw the input tray sticking out the front, we thought we had jammed it like we usually jam the ones back at the bunker. You wouldn't think sliding a tray into the bottom of a printer would require a lot of engineering but Canon simply hasn't figured it out. So we kept trying to reseat the tray. Until we lifted the printer up and saw it was seated. It just sticks out. All the time. If that wasn't bad enough to rule this Canon out, the control panel was. It stores flat against the front of the unit, another concession to size, but swivels up to a 45 degree display angle for use. That's annoying enough but what really disappointed us was that when extended, it isn't locked into place. Press something and it yields noticeably. Very poor engineering. We liked the small footprint of the Epson. To accommodate that bread box size, however, the company simply omitted the input tray. You load paper in the manual feed slot on the back, after flipped up its cover and pulling out its support arm. It's almost as if this isn't a printer at all but something that can also print. Occasionally. We thought it would be a hassle to set up the paper every time you want to print and a hazard to leave paper loaded. Another compromise caused by the small size was the control panel. Like the Canon, it stores flush against the front side but can be swiveled up so you can more easily use it. It stayed firmly in place when we did swivel it up but that's another task you really shouldn't have to do. When we turned on the unit, the LCD displayed a rather primitive typeface in a contorted menu system. In this era, when you see a color screen, you expect it to be touch sensitive. The Epson, though, is not. You have to use the adjacent buttons. The menu system itself was unintuitive and difficult to navigate. Nothing was simple. We have to give the Epson credit for including an SD card reader, which the other two models omitted. We handle that with a separate reader but it can be a convenience. HP should get an industrial design award for its ENVY 5055. It's simply gorgeous. It looks bigger than the other two units and while it isn't nearly as tall as either of them, it is a little wider, which accommodates a full input paper tray that slides smoothly out the bottom front when you flip open a door. Very nicely done. The sleek look is attractive but it's also functional. That paper tray door, for example bows out near the middle so you can feel its lip. The scanner cover, likewise, has a slight bow in the front so you instinctively reach to open it. And there's no mystery to opening the unit up either with two indentations on the side to indicate where to pull up. The unusually excellent design continued inside the unit, which opens more than the others, allowing significantly more light to come in when you can replace the ink cartridges. 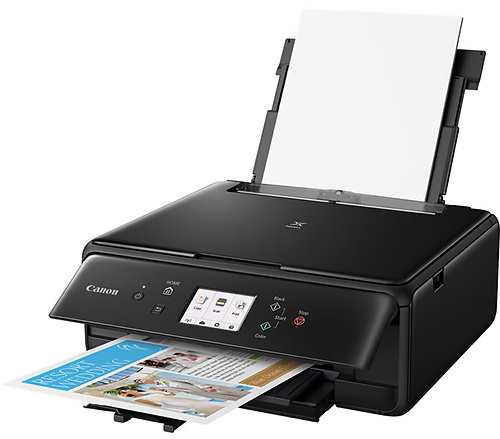 And it doesn't hurt that there are only two cartridges (color and black) with built-in print heads so you get a new printer every time you replace the $11 and $13 cartridges. No Canon B200 errors here. The control panel is a touchscreen black and white, a little smaller than we would have liked but that keeps the price down. It's simple and easy to follow, putting the Canon and Epson menus to shame. And it's on the sloped front of the unit so it's already at a 45 degree angle. Genius. And if shame isn't enough, the firmware includes slideshows to explain the device's features and processes (like how to change the cartridges). 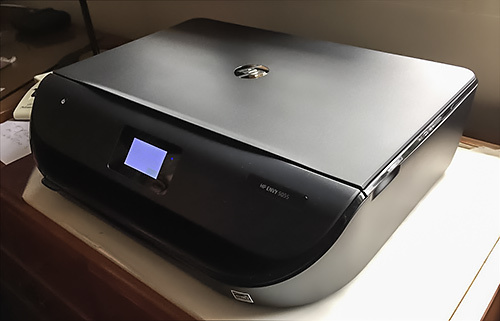 We pointed out many years ago in an HP review that a four-ink configuration just doesn't quite compare to the five ink configuration of other manufacturers. That fifth ink is a photo black, a dye that deepens the four-color printing significantly. But HP's ink formulation has improved significantly over the years and their pigment black with color dyes does a comparable job to the five-ink sets in these other units. Not to mention that buying an all-in-one device is not the same thing as buying a gallery-worthy 12-color printer. You want credible photo prints. And with swellable gel papers (the usual inkjet photo paper, that is) or HP's porous optimized chromophore photo papers, you'll be very happy with the prints made with four inks. HP's ink specialists have done a great job in expanding the palette their four inks can cover. So while we acknowledge the theoretical limitations, at this level it really isn't a significant issue. We researched ink prices for the three units before making a decision. And it was instructive. The two five-cartridge units were the most expensive to replenish. 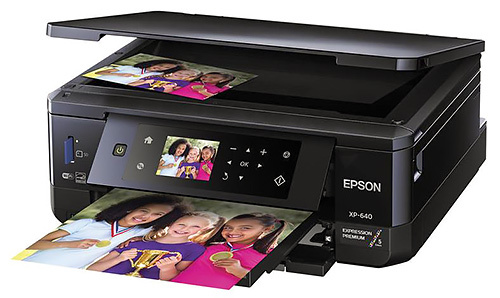 Canon is about $10 more than Epson, which is about $50. Both companies proudly boast that with individual cartridges you only replace what runs out. But our experience over the years is that you run out of all of them simultaneously. A lot of ink, after all, is used to flush the print heads at start up. So we weren't terribly put off by HP's two cartridge system of a $13 color cartridge and an $11 black cartridge, both of which include print heads. We have no way of comparing capacity, of course. But HP has an intriguing ink service called InstantInk, about which we've previously reported. We also took a deeper look at HP's paper and ink technology in 2015. With InstantInk, your printer reports over the Internet the number of pages you print each month. If you print 15 or less, ink is free. You get 10 more pages a month for $1. So 25 pages a month or 300 pages a year would be $12. But if you print 50 pages a month, your ink costs are $2.99 (15 more pages for $1) or $35.88 a year. There are options for 100 pages a month at $4.99 (20 more pages for $1) and 300 pages at $9.99 (25 more pages for $1). It doesn't matter whether you print black and white or color. 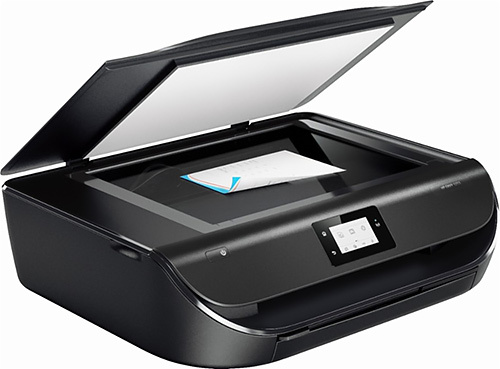 With the service, when your printer reports low ink HP sends you new high-capacity cartridges. You never run out of ink. So it's convenient as well as cost effective. HP claims the plan reduces materials consumption by 57 percent, energy usage by 86 percent, water usage by 89 percent and the carbon footprint of purchase and disposal by 84 percent. A set of inks per year for the Canon at $60 a year compares to the $4.99/month plan that meters 100 pages a month. The only catch with this program is that you shouldn't start it right away (or your page count will start). Check your ink levels and when the initial cartridges are getting low, sign up. And you can always cancel it, buying cartridges online or at brick-and-mortar establishments as needed. We confess to having kept HP in the dog house for a few years for its failure to update its drivers to remain compatible with operating system updates. The company seemed to think you should buy a new printer every time your operating system was updated. Canon and Epson have both been much better than that. Canon does take some heat for operating system incompatibilities but generally manages to keep their printers functional for many years. So we were reluctant to put our money on HP but the superior engineering and lower ink costs won us over. And these days printers don't even ship with CDs. The operating system already has the driver and recognizes the printer. So we went with the HP. Installing the HP was not foolproof. First, we'll note that you can grab the plastic wrap, which has two handles, to lift the thing out of its box. That isn't obvious when you open the carton. Don't grab the Styrofoam. Find the plastic handles. There's very little packing material to remove. One blue tape holding the lid down and the tray in. One foam sheet protecting the scanner glass. One cardboard spacer keeping the print system from moving. Adding paper is trivial and installing the ink cartridges was easy as well. The trouble, really, was with the software installation. We elected to go wireless. HP recommends downloading an installer from 123.hp.com. And we did. But it got hung up trying to connect the printer to our network. Why? We suspect the problem was that our network is password protected and the installer never asked for a password. Stymied by the installer, we resorted to the control panel's manual setup. That let us identify the network, enter the password and connect. Unfortunately, the small screen means letters and numbers are bunched on the keys so you have to tap the "abc" key twice for a "b" and three times to get a "c."
Cnotrol Panel. Nicely designed touchscreen with extensive help. From there we went to the Printers System Preferences on macOS Sierra. That found our printer on the network with no problem. We added it and checked the supplies (ink cartridges full). Then we scanned a photo. No problem. We scanned that photo again using Image Capture and that worked as well. Even better, automatically cropping the image. And, of course, we were able to print from our applications. With duplex printing enabled. So we had full functionality. Paper Catch. The arm swings out to catch the printed sheets, which exit rather forcefully. 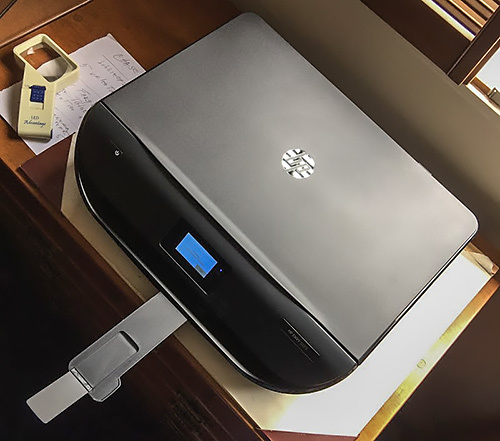 The next trick was to set up printing from an iPhone with Bluetooth enabled using the HP app. And again we had trouble with the installation. The problem this time was that we elected to install a new printer. So the app asked for the printer's password. We entered the router's password (the only one there was) but that didn't fly. The solution was to install it as an existing printer. The app found it right away and a few seconds later, we printed a photo. Scan and print quality was fine -- even pleasing. Nothing special, perhaps, but no disappointments. But that's exactly what you want in an all-in-one device. Reliable, good quality output. The capabilities of these three units if not their specifications are equivalent. But the HP stood out for its superior industrial design and its unique ink subscription program. We can appreciate that wireless installation may frustrate many, but it's become a lot easier than it used to be. And you can always call for help. You won't pay tax with online ordering (our affiliated links are in the sidebar) but we found big box prices a bit lower (if you avoid going for the usual up-sale pitches). Whichever model you choose, however, they've all come a long way from just a few years ago both in function and quality. Which is good news.